Brighton will be hoping to maintain their fabulous start to December when they travel to struggling Burnley tomorrow, writes Bradley Stratton. Albion earned bragging rights over arch-rivals Crystal Palace in what will go down as one of the most memorable nights of football under the Amex lights on Tuesday. 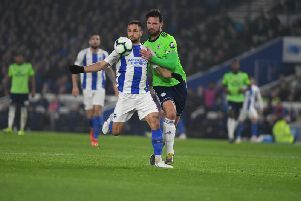 In a drama filled first half, Glenn Murray put the Seagulls ahead from the penalty spot on 24 minutes, however an off-the-ball incident involving Shane Duffy and Palace’s Patrick van Aanholt resulted in the Albion defender being shown a straight red card four minutes later. However any worries that Chris Hughton’s side had about letting their lead slip evaporated quickly. Leon Balogun scored on the half volley with his first touch after coming off the bench, and fellow substitute Florin Andone made it 3-0 with a spectacular solo goal just before the break, with Palace's only goal coming from the penalty spot late in the second half. After back-to-back wins to begin the final month of 2018, Albion sit pretty in tenth place with 21 points heading into their trip to Turf Moor. Having defied all the odds to finish in seventh and secure a Europa League place at the end of last season, Burnley are now feeling the hangover effect of having to begin their European campaign back in July. Having had next-to-no turnover of players from the core of last season’s squad, the Clarets are without a win since the end of September and have lost six of their last eight outings in the Premier League. They have picked up nine points so far this season, leaving them in the bottom three alongside Southampton and Fulham. While the sides mentioned above have both changed managers in the past month in an effort to change their fortunes, it’s less likely that the Lancashire side will follow suit. They stuck with Sean Dyche when they were last relegated in 2014, and could do the same if they feel he is still best placed to lead their fight for survival. There has been very little to separate the sides in recent years, with the previous five meetings between the sides ending in a draw. Both of their clashes in the top flight last season finished 0-0. The Clarets kept 12 clean sheets last season but have managed just three this year and Joe Hart has made more saves, 69, than any other Premier League goalkeeper. Burnley lost 3-1 at home to Liverpool on Wednesday when James Tarkowski returned to the starting line-up and manager Sean Dyche could keep the same team who took a 1-0 lead against the title challengers. That would see former Albion duo Ashley Barnes and Chris Wood lead the line up front, with Sam Vokes on the bench. Midfielder Steven Defour missed the Clarets' match with a knee injury on Wednesday. Likely line-up: Hart; Bardsley, Tarkowski, Mee, Taylor; Berg Gudmundsson, Westwood, Cork, Brady; Barnes, Wood. Subs (from): Heaton, Lowton, Gibson, Hendrick, Long, Lennon, Vydra, Vokes, Defour. Albion will have to make at least one change from Tuesday's win at Crystal Palace as Shane Duffy serves the first match of a three-game ban for his sending-off against the Eagles. Top-scorer Glenn Murray (shoulder) and winger Jose Izquierdo (knee) are both injury doubts after going off against Palace. Winger Alireza Jahanbakhsh is back in training but won't be back for Saturday's match. Midfielder Dale Stephens is back available following a three-game ban for his red card at Cardiff last month. Likely line-up: Ryan; Montoya, Balogun, Dunk, Bernardo; Knockaert, Propper, Bissouma, March; Gross; Andone. Subs (from): Steele, Button, Bruno, Bong, White, Kayal, Stephens, Izquierdo, Murray, Locadia, Suttner.